I was touched by a video I watched yesterday and I wanted to share it with you. It is called I Pray When… It is about 2 minutes long, and I hope you watch it because I cannot better express the message it gives about prayer. I am so grateful that we have a way to communicate with our Father in Heaven, whenever we need, no matter where we are or what is going on in our lives. Now to tell you about these Cilantro Cubes! I am the kind of person who can only use about half of a bunch of cilantro before it goes bad. This drives me crazy because I hate to see it go to waste, and it is usually only shortly before I would have used it again. This dilemma lead me to the idea of freezing cilantro. I have seen people freeze other herbs, such as chives or lemon grass, so why not cilantro? While some herbs can be frozen as-is, without water, I think cilantro is best frozen in water. This is probably one of my favorite kitchen tips! It has come in so handy! Granted, this solution does limit the versatility of the cilantro, as you might not want to put frozen cilantro on top of your tacos, but it still has quite a few uses! And hey, having frozen cilantro is better than having mushy bad cilantro. I also do this with limes that I was unable to use (just freeze the lime juice, no water) before they start getting old. I have found cilantro cubes useful for recipes such as Limon Tostadas and Quick Noodle Pho where it doesn’t really matter if the cilantro is frozen or not, because it will be heated any way. I always just put the whole cube into the beans or soup, but you could also put them in a colander under cold water to remove the ice (you may lose a few leaves and some of the cilantro oils this way, however). Finely chop the cilantro leaves and upper stems, discarding the lower leafless stems. Fill 1-2 ice trays (depending on the size of the cilantro bunch) with the chopped cilantro. Fill the trays with water, pushing the leaves into the water. 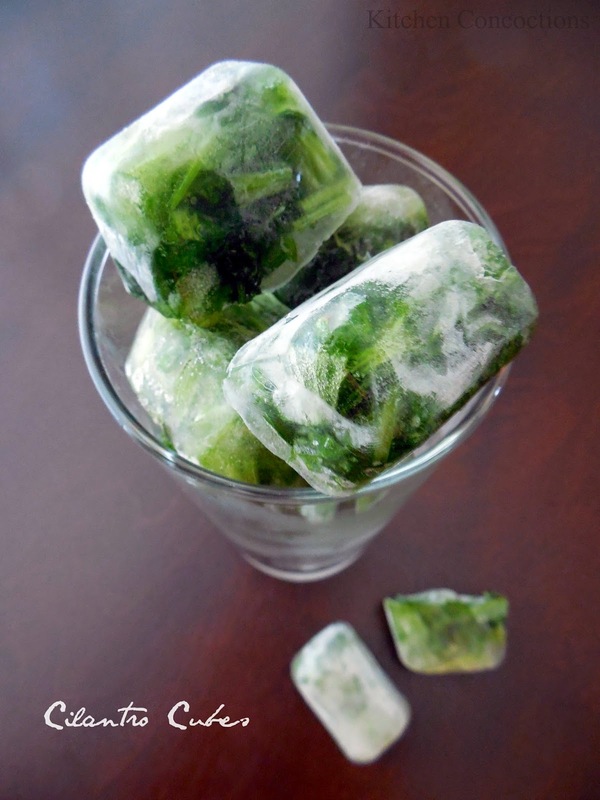 Freeze until solid and then remove the cubes from the ice trays and put them in an airtight container. Return to the freezer and freeze for up to 1 month.